This topic describes Windows 7's added support for Flip Mode Present and its associated present statistics in Direct3D 9Ex and Desktop Window Manager. Target applications include video or frame rate-based presentation applications. Applications that use Direct3D 9Ex Flip Mode Present reduce the system resource load when DWM is enabled. Present statistics enhancements associated with Flip Mode Present enable Direct3D 9Ex applications to better control the rate of presentation by providing real-time feedback and correction mechanisms. Detailed explanations and pointers to sample resources are included. Flip Mode Presentation of Direct3D 9Ex is an improved mode of presenting images in Direct3D 9Ex that efficiently hands off rendered images to Windows 7 Desktop Window Manager (DWM) for composition. Beginning in Windows Vista, DWM composes the entire Desktop. When DWM is enabled, windowed mode applications present their contents on the Desktop by using a method called Blt Mode Present to DWM (or Blt Model). With Blt Model, DWM maintains a copy of the Direct3D 9Ex rendered surface for Desktop composition. When the application updates, the new content is copied to the DWM surface through a blt. For applications that contain Direct3D and GDI content, the GDI data is also copied onto the DWM surface. 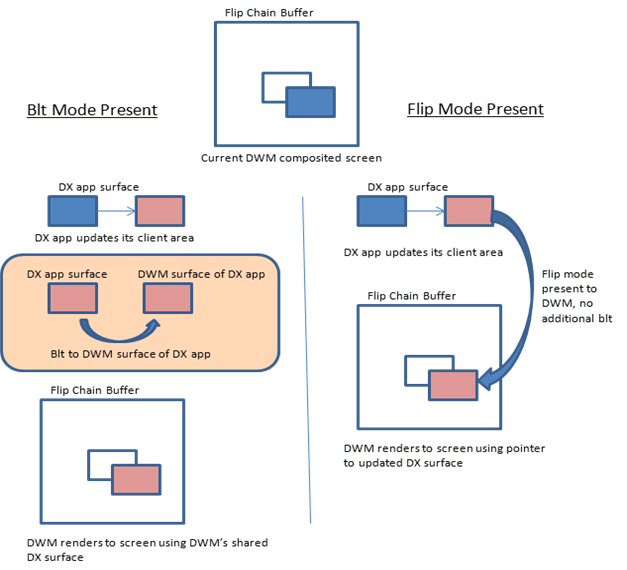 Available in Windows 7, Flip Mode Present to DWM (or Flip Model) is a new presentation method that essentially enables passing handles of application surfaces between windowed mode applications and DWM. In addition to saving resources, Flip Model supports enhanced present statistics. Present statistics are frame-timing information that applications can use to synchronize video and audio streams and recover from video playback glitches. The frame-timing information in present statistics allows applications to adjust the presentation rate of their video frames for smoother presentation. In Windows Vista, where DWM maintains a corresponding copy of the frame surface for Desktop composition, applications can use present statistics provided by DWM. This method of obtaining present statistics will still be available in Windows 7 for existing applications. In Windows 7, Direct3D 9Ex-based applications that adopt Flip Model should use D3D9Ex APIs to obtain present statistics. When DWM is enabled, windowed mode and full-screen exclusive mode Direct3D 9Ex applications can expect the same present statistics information when using Flip Model. Direct3D 9Ex Flip Model present statistics enable applications to query for present statistics in real time, rather than after the frame has been shown on screen; the same present statistics information is available for windowed-mode Flip-Model enabled applications as full-screen applications; an added flag in D3D9Ex APIs allows Flip Model applications to effectively discard late frames at presentation time. Direct3D 9Ex Flip Model should be used by new video or frame rate-based presentation applications that target Windows 7. Because of the synchronization between DWM and the Direct3D 9Ex runtime, applications that use Flip Model should specify between 2 to 4 backbuffers to ensure smooth presentation. Those applications that use present statistics information will benefit from using Flip Model enabled present statistics enhancements. Performance improvements of Direct3D 9Ex Flip Mode Present are significant on the system when DWM is on and when the application is in windowed mode, rather than in full screen exclusive mode. The following table and illustration show a simplified comparison of memory bandwidth usages and system reads and writes of windowed applications that choose Flip Model versus the default usage Blt Model. Flip Mode Present reduces system memory usage by reducing the number of reads and writes by the Direct3D runtime for the windowed frame composition by DWM. This reduces the system power consumption and overall memory usage. Applications can take advantage of Direct3D 9Ex Flip Mode present statistics enhancements when DWM is on, regardless of whether the application is in windowed mode or in full screen exclusive mode. Flip Mode Present entails that the application can take advantage of real-time present statistics feedback and correction mechanisms when DWM is on. However, applications that use Flip Mode Present should be aware of limitations when they use concurrent GDI API rendering. You can modify existing applications to take advantage of Flip Mode Present, with the same benefits and caveats as the newly developed applications. Direct3D 9Ex applications that target Windows 7 can opt into the Flip Model by creating the swap chain with the D3DSWAPEFFECT_FLIPEX enumeration value. To opt into the Flip Model, applications specify the D3DPRESENT_PARAMETERS structure, and then pass a pointer to this structure when they call the IDirect3D9Ex::CreateDeviceEx API. This section describes how applications that target Windows 7 use IDirect3D9Ex::CreateDeviceEx to opt into the Flip Model. For more information about the IDirect3D9Ex::CreateDeviceEx API, see IDirect3D9Ex::CreateDeviceEx on MSDN. For convenience, the syntax of D3DPRESENT_PARAMETERS and IDirect3D9Ex::CreateDeviceEx is repeated here. When SwapEffect is set to the new D3DSWAPEFFECT_FLIPEX swap chain effect type, the back buffer count should be equal or greater than 2, to prevent an application performance penalty as a result of waiting on the previous Present buffer to be released by DWM. When the application also uses present statistics associated with D3DSWAPEFFECT_FLIPEX, we recommend that you set the back buffer count to from 2 to 4. Using D3DSWAPEFFECT_FLIPEX on Windows Vista or previous operating system versions will return fail from CreateDeviceEx. The new D3DSWAPEFFECT_FLIPEX swap chain effect type designates when an application is adopting Flip Mode Present to DWM. It allows the application more efficient usage of memory and power, and also enables the application to take advantage of full-screen present statistics in windowed mode. Full-screen application behavior is not affected. If Windowed is set to TRUE and SwapEffect is set to D3DSWAPEFFECT_FLIPEX, the runtime creates one extra back buffer and rotates whichever handle belongs to the buffer that becomes the front buffer at presentation time. The D3DPRESENTFLAG_LOCKABLE_BACKBUFFER flag cannot be set if SwapEffect is set to the new D3DSWAPEFFECT_FLIPEX swap chain effect type. Use the guidelines in the following sections to design your Direct3D 9Ex Flip Model applications. Applications should use Direct3D 9Ex Flip Mode Present in an HWND that is not also targeted by other APIs, including Blt Mode Present Direct3D 9Ex, other versions of Direct3D, or GDI. Flip Mode Present can be used to present to child windows; that is, applications can use Flip Model when it is not mixed with Blt Model in the same HWND, as shown in the following illustrations. Because Blt Model maintains an additional copy of the surface, GDI and other Direct3D contents can be added to the same HWND through piecemeal updates from Direct3D and GDI. Using the Flip Model, only Direct3D 9Ex content in D3DSWAPEFFECT_FLIPEX swap chains that are passed to DWM will be visible. All other Blt Model Direct3D or GDI content updates will be ignored, as shown in the following illustrations. Therefore, Flip Model should be enabled for swap chain buffers surfaces where the Direct3D 9Ex Flip Model alone renders to the entire HWND. Some Direct3D 9Ex applications use GDI's ScrollWindow or ScrollWindowEx functions to update window contents when a user scroll event is triggered. ScrollWindow and ScrollWindowEx perform blts of window contents on screen as a window is scrolled. These functions also require Blt Model updates for GDI and Direct3D 9Ex content. Applications that use either function will not necessarily display visible window contents scrolling on screen when the application is in windowed mode and DWM is enabled. We recommend that you not use GDI's ScrollWindow and ScrollWindowEx APIs in your applications, and instead redraw their contents on screen in response to scrolling. Applications that use Flip Model should not use multiple Flip Model swap chains targeting the same HWND. Present statistics are frame timing information that media applications use to synchronize video and audio streams and recover from video playback glitches. To enable present statistics availability, the Direct3D 9Ex application must ensure that the BehaviorFlags parameter that the application passes to IDirect3D9Ex::CreateDeviceEx contains the device behavior flag D3DCREATE_ENABLE_PRESENTSTATS. For convenience, the syntax of IDirect3D9Ex::CreateDeviceEx is repeated here. Direct3D 9Ex Flip Model adds the D3DPRESENT_FORCEIMMEDIATE presentation flag that enforces the D3DPRESENT_INTERVAL_IMMEDIATE presentation-flag behavior. The Direct3D 9Ex application specifies these presentation flags in the dwFlags parameter that the application passes to IDirect3DDevice9Ex::PresentEx, as shown here. when the application sets the SwapEffect member of D3DPRESENT_PARAMETERS to D3DSWAPEFFECT_FLIPEX in a call to CreateDeviceEx. This flag can be specified only if the application sets the SwapEffect member of D3DPRESENT_PARAMETERS to D3DSWAPEFFECT_FLIPEX in a call to CreateDeviceEx. The application can use this flag to immediately update a surface with several frames later in the DWM Present queue, essentially skipping intermediate frames. Windowed FlipEx-enabled applications can use this flag to immediately update a surface with a frame that is later in the DWM Present queue, skipping intermediate frames. This is especially useful for media applications that want to discard frames that have been detected as late and present subsequent frames at composition time. IDirect3DDevice9Ex::PresentEx returns invalid parameter error if this flag is improperly specified. To obtain present statistics information, the application obtains the D3DPRESENTSTATS structure by calling the IDirect3DSwapChain9Ex::GetPresentStatistics API. The D3DPRESENTSTATS structure contains statistics about IDirect3DDevice9Ex::PresentEx calls. The device must be created by using a IDirect3D9Ex::CreateDeviceEx call with the D3DCREATE_ENABLE_PRESENTSTATS flag. Otherwise, the data returned by GetPresentStatistics is undefined. A Flip-Model-enabled Direct3D 9Ex swap chain provides present statistics information in both windowed and full-screen modes. For Blt-Model-enabled Direct3D 9Ex swap chains in windowed mode, all D3DPRESENTSTATS structure values will be zeroes. For convenience, the syntax of GetPresentStatistics is repeated here. The IDirect3DSwapChain9Ex::GetLastPresentCount method returns the last PresentCount, that is, the Present ID of the last successful Present call that was made by a display device that is associated with the swap chain. This Present ID is the value of the PresentCount member of the D3DPRESENTSTATS structure. For Blt-Model-enabled Direct3D 9Ex swap chains, while in windowed mode, all D3DPRESENTSTATS structure values will be zeroes. For convenience, the syntax of IDirect3DSwapChain9Ex::GetLastPresentCount is repeated here. The PresentCount value that GetLastPresentCount returns does not update when a PresentEx call with D3DPRESENT_DONOTWAIT specified in the dwFlags parameter returns failure. When PresentEx is called with D3DPRESENT_DONOTFLIP, a GetPresentStatistics call succeeds but does not return an updated D3DPRESENTSTATS structure when the application is in windowed mode. PresentRefreshCount is equal to SyncRefreshCount when the application presents on every vsync. When DWM is off, windowed applications display directly to the monitor screen without going through a flip chain. In Windows Vista, there is no support for obtaining frame statistics information for windowed applications when DWM is off. To maintain an API where applications need not be DWM- aware, Windows 7 will return frame statistics information for windowed applications when DWM is off. The frame statistics returned when DWM is off are estimations only. A sample application that takes advantage of Direct3D 9Ex Flip Model and associated present statistics functionality is shown in the D3D9ExFlipEx sample on the MSDN Code Gallery. Ensure the sample application is running on Windows 7 or later operating system version. Set the SwapEffect member of D3DPRESENT_PARAMETERS to D3DSWAPEFFECT_FLIPEX in a call to CreateDeviceEx. Set D3DCREATE_ENABLE_PRESENTSTATS in the BehaviorFlags parameter of CreateDeviceEx. Queue Present calls: recommended backbuffer count is from 2 to 4. Direct3D 9Ex sample adds an implicit backbuffer, actual Present queue length is backbuffer count + 1. Create helper Present queue structure to store all successfully submitted Present's Present ID (PresentCount) and associated, calculated/expected PresentRefreshCount. Get the Present ID (PresentCount) and vsync count where the frame is shown (PresentRefreshCount) of the frame whose present statistics is obtained. Retrieve the expected PresentRefreshCount (TargetRefresh in sample code) associated with the Present ID. If actual PresentRefreshCount is later than expected, a glitch has occurred. Calculate how many frames to skip (g_ iImmediates variable in sample code). Present the skipped frames with interval D3DPRESENT_FORCEIMMEDIATE. Set a limit to the glitch length (GLITCH_RECOVERY_LIMIT in sample). If the sample application cannot recover from a glitch that is too long (that is say, 1 second, or 60 vsyncs on 60Hz monitor), jump over the intermittent animation and reset the Present helper queue. // then, glitch is detected! The following illustration shows an application with backbuffer count of 4. The actual Present queue length is therefore 5. Frame A is targeted to go on screen on sync interval count of 1 but was detected that it was shown on sync interval count of 4. Therefore a glitch has occurred. Subsequent 3 frames are presented with D3DPRESENT_INTERVAL_FORCEIMMEDIATE. The glitch should take a total of 8 Present calls before it is recovered - the next frame will be shown as per its targeted sync interval count. Create a backup list of all the LastPresentCount IDs (obtained via GetLastPresentCount) and associated estimated PresentRefreshCount of all the Presents submitted. When the application calls PresentEx with D3DPRESENT_DONOTFLIP, the GetPresentStatistics call succeeds but does not return an updated D3DPRESENTSTATS structure when the application is in windowed mode. Call GetPresentStatistics to obtain the actual PresentRefreshCount associated with each Present ID of frames shown, to make sure that the application handles failure returns from the call. If actual PresentRefreshCount is later than estimated PresentRefreshCount, a glitch is detected. Compensate by submitting lagging frames' Present with D3DPRESENT_FORCEIMMEDIATE. When one frame is presented late in the Present queue, all subsequent queued frames will be presented late. D3DPRESENT_FORCEIMMEDIATE will correct only the next frame to be presented after all the queued frames. Therefore, the Present queue or backbuffer count should not be too long -- so there are less frame glitches to catch up with. The optimal backbuffer count is 2 to 4.
reduce CPU and GPU usage by rendering with less workload. in the case of video decode, decode faster by reducing quality and, therefore, CPU and GPU usage. On Windows 7, applications that display video or gauge frame rate during presentation can opt into Flip Model. The present statistics improvements that are associated with Flip Model Direct3D 9Ex can benefit applications that synchronize presentation per frame rate, with real time feedback for glitch detection and recovery. Developers that adopt the Direct3D 9Ex Flip Model should take targeting a separate HWND from GDI content and frame rate synchronization into account. Refer to details in this topic, the D3D9ExFlipEx MSDN Code Gallery sample, and MSDN documentation. For additional documentation, see DirectX Developer Center on MSDN. We encourage you to use Direct3D 9Ex Flip Model and its present statistics on Windows 7 when you create applications that attempt to synchronize presentation frame rate or recover from display glitches.